There are many options in vinyl flooring such as natural linoleum, vinyl, sheet goods, tile, plank, floating click, LVT, LVP, rigid core. With all the different terms out there, it can be confusing. Let’s start with our favorite…Linoleum. Natural linoleum is a very green product in that it is bio-based, biodegradable and non-toxic. We carry Marmoleum linoleum which has been around for 80 plus years. It is made of all natural ingredients: linseed and or tall oil, limestone, tree rosin, wood flour, natural mineral pigments, and jute. Its hygienic anti-microbial properties along with it being asthma & allergy friendly makes it a perfect fit for medical office settings. It is durable and stain resistant and its color goes all the way through the product. Marmoleum also protects equipment that is sensitive to static electricity making it ideal for computer rooms, server rooms and areas with sensitive equipment. Because of this anti-static property it is easy to clean and maintain. Less expensive than many other flooring options, sheet vinyl comes in many different patterns & colors and is typically available in 12’ goods. It is water resistant, reduces noise and is comfortable under foot. It is easy to maintain and fairly durable though is susceptible to damage from sharp objects which could result in having to replace the entire floor. 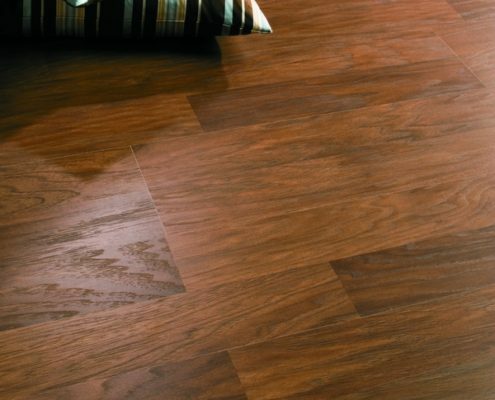 Simply meaning luxury vinyl tile or luxury vinyl plank. Instead of coming in sheets, it comes in tile or plank shape that is glued down with a releasable adhesive or clicked together. It comes in ceramic tile look or wood with wood being the most popular because of its individual plank sizing mimicking real wood planks. It has the benefits of sheet vinyl but can be easily repaired if it becomes damaged from sharp objects by simply replacing a tile or plank. This new generation of vinyl plank flooring combines a stiff waterproof core with LVP’s and LVT’s adding additional strength and density making it possible to install over many hard surfaces. They are very durable resisting indentations, scratches and maintaining dimensional stability under extreme temperature change. Some of these products also have a cork backing that adds additional comfort and sound deadening properties. Locking planks make for an easy glueless installation. These products are 100% waterproof and more durable than sheet vinyl. They are also easy to clean.